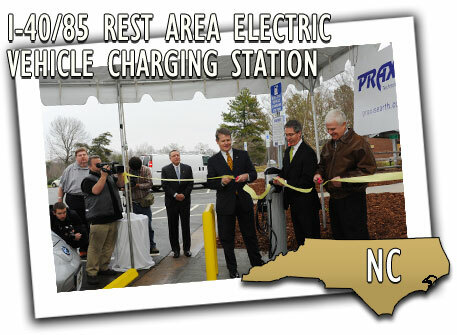 Officials from the North Carolina Department of Transportation, North Carolina Department of Commerce, and Praxis Technologies Inc. cut the ribbon Jan. 11 on an innovative project to install one of the first electric vehicle charging stations at a state rest area. The ceremony took place at the Alamance County Rest Area on Interstate 40/85 near Burlington, which is now the site of two charging stations. A Nissan Leaf from a Durham auto dealership was on site to provide a demonstration. "With this project, the state of North Carolina and its partners are helping lay the groundwork for an infrastructure that will support the increasing number of electric vehicles in North Carolina and the nation," Don Lee, state roadside environmental engineer, said in a statement. The charging stations, as well as accompanying educational signage, were provided by Raleigh-based Praxis Technologies through a grant from the NCDOC's Green Business Fund program. In addition to the charging stations at the Alamance County Rest Area, Praxis provided two more charging stations to NCDOT, which were recently installed at the rest area located along I-40 at the Interstate 95 junction near Benson. The charging stations are classified as "Level 2," which means they can fully charge a vehicle in six to seven hours. There is no cost for using them. Rest areas in Alamance and Johnston counties were selected by NCDOT because they are high-traffic locations that welcome a combined 1 million visitors annually and are located along commuter routes near major metropolitan areas. Motorists will have the option of charging their vehicle for a short period of time while taking a break from the highway to gain enough charge to travel to another charging location. NCDOT continues to work with its private partners to investigate the possibility of installing more charging stations at rest areas in the future, including "Level 3" stations that are able to fully charge a vehicle in as little as 30 minutes. A Flickr photo gallery of the event is available at bit.ly/NCDOT011112.